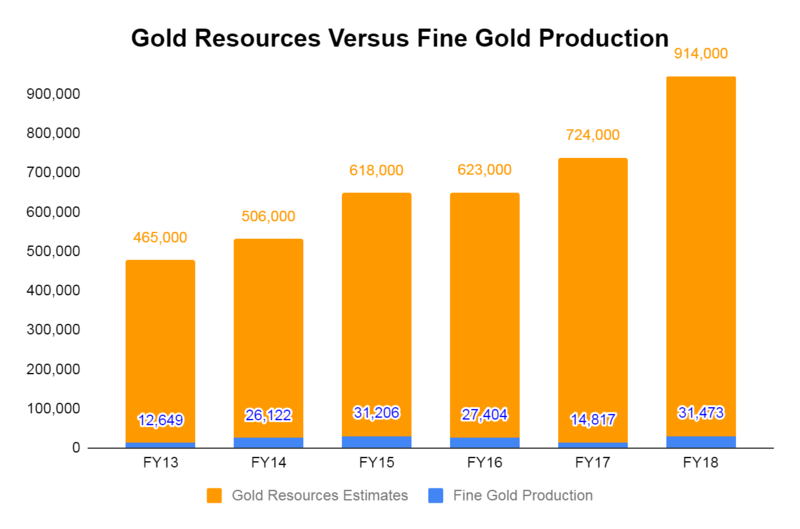 SI Research: Record High Unmined Gold Resources Brightens CNMC Goldmine? Since its listing on 28 October 2011 at $0.40 a piece, the first Catalist-listed gold producer in Singapore, CNMC Goldmine Holdings’ (CNMC) share price is down by 45 percent at $0.22 as at the time of writing. In the past ten years, gold had been left dead with an equity bull market and a booming economy. However, the precious metal started to rally in late 2018 as economic and geopolitical uncertainties sent shock waves through global stock markets. The precious metal bulls are further fuelled by a surprisingly dovish stance taken by the US Federal Reserve as the Fed sees no rate rise for 2019 amid slower US growth. Meanwhile, recession fears amid slowing global growth brings gold’s appeal as a safe-haven asset to the forefront and this signals of a possible resurgence in gold, precious metals and the mining industry as a whole. With the group’s large ore reserves and a new carbon-in-leach plant, CNMC could be worth a look as gold starts to heat up. CNMC’s flagship Sokor Gold Project in Malaysia’s Kelantan state is an extensive region covering an area of 10 square kilometres with five identified gold deposits regions, namely Manson’s Lode, New Discovery, New Found, Sg. Ketubong and Rixen. As at 31 December 2018, the total measured, indicated and inferred gold resources for the Sokor Project are 17.91 million tonnes at 1.6 grams per ton gold grade, which would amount to 914,000 ounces of contained gold, inclusive of material used to define ore reserves. Compared to the previous estimate as at 31 December 2017, there has been a 26.2 percent increase in gold mineral resources of 724,000 ounces and it marked the highest untapped gold resources recorded. Apart from gold, mineral resources at Manson’s Lode, one of the five gold deposits, contain significant amounts of silver, lead and zinc, amounting to a total of 1,928,000 ounces of contained silver, 23,025 tonnes of contained lead and 23,505 tonnes of contained zinc. As gold is still CNMC’s main focus, the other minerals are just icing on the cake. Nevertheless, this further validates the gold mining project at Sokor since 2010 remains commercially viable. Meanwhile, with the presence of significant amounts of silver, lead and zinc resources, the group are planning to construct a flotation plant to monetize these base metal resources. Completed in six months with a budget of RM25 million, CNMC’s newly-built carbon-in-leach (CIL) plant officially commenced operations in May 2018. The new plant, which is CNMC’s third production facility at the Sokor gold field, can process approximately 500 tonnes of ore per day and boasts a gold recovery rate of up to 95 percent. This is a significant improvement when compared to approximately 65 percent for CNMC’s heap leaching plant, which has been the main production facility since 2012. In FY18, revenue increased by US$20.4 million to reach a record high revenue of US$39.5 million despite a 2.8 percent lower average realised gold price at US$1,256.55 per ounce. Meanwhile, the production volume of fine gold climbed from former peak of 31,205.85 ounces in FY15 to 31,473.07 ounces in FY18 are the result of higher volume of gold pour from CIL. Going forward, CIL plant will deliver a full year production to further support the topline growth and production growth of FY19 amid a bullish outlook of the gold price. 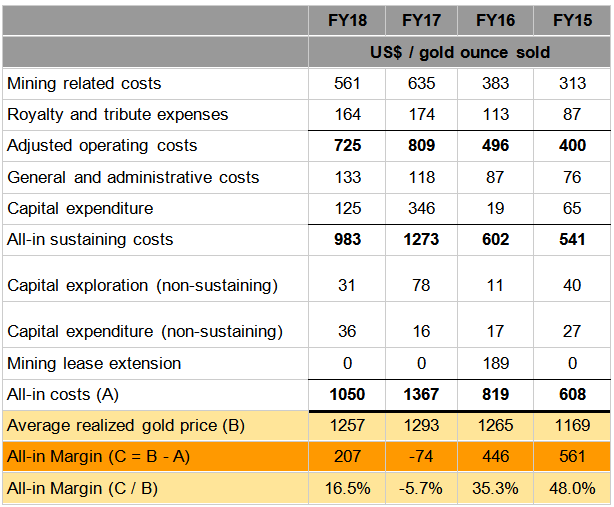 In addition to the higher output in FY18, the group’s average all-in cost of production for every ounce of gold in FY18 was lower at US$1,050 ( FY17: US$1,367) as the capital expenditure for the CIL plant has been fully paid for and already boosting production. The group’s production cost for FY19 is expected to be even lower. As at 31 December 2018, CNMC had cash and equivalents of US$17.9 million, while total liabilities were at US$11.1 million. Of the group’s total liabilities, borrowing and debt securities amounted to only US$0.8 million. This puts the group in a net cash position of US$17.1 million or US$0.042 ($0.057) per share. While the net cash per share against the group’s current share price of $0.22 is not much to boast about, a company that has this much potential while maintaining a strong balance sheet position is likely to attract investors’ interest..